With her new edition of Experience Music, Katherine Charlton has drawn on her extensive experience in the classroom to create a listening experience that motivates and engages students. Connect® for Experience Music ensures that students can come to class confident and prepared, as they develop the active listening skills they need for success in the course and a lifetime of more meaningful musical experiences. 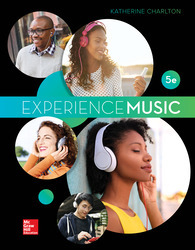 With McGraw-Hill Connect® Music, students can experience music personally while interacting with the integrated listening process.